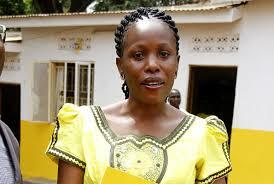 MP Judith Nabakooba says the youths were paid to cause chaos. File photo. MITYANA–Angry youths in Mityana district yesterday pelted stones at their Members of Parliament who were in the district to drum up support for the contentious age limit bill. The irate youths accused their MPs; Godfrey Kiwanda Suubi of Mityana North who also doubles as State Minister for Tourism and Judith Nabakooba, the Mityana district Woman MP of supporting the amendment of the Constitution. The legislators had allegedly organized a rally in Kiyoganyi Township to preach the Constitutional amendment gospel when hell broke loose. MP Nabakooba, however, said the youths were paid to disrupt the rally. The former police spokesperson who was appearing on CBS radio urged the police to hunt down the youths she termed as drunkards. “I was saddened to see youths that I don’t even know in this area. They were drunk and shouting on top of their voices,” she said. She said the youths were paid Shs10,000 each to cause chaos by people who were watching the chaos from a safe distance.